I had some visitors in my bed this morning. They were quite a rowdy crew, and they've been running amuck here for quite a while. Jonathan wants me to introduce them. 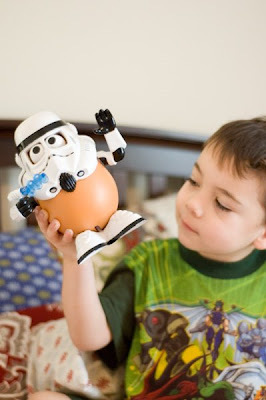 This is his storm trooper potato head that someone gave him for Christmas. 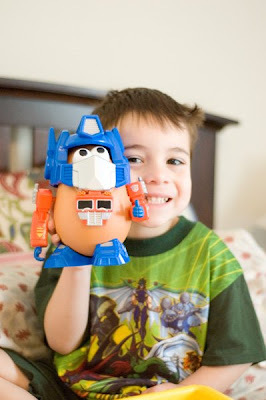 And this is his transformer potato head that he bought with the money from his Valentine's cards. He knew exactly what he wanted to buy when he counted the money. ...and get a little crazy. I think he was trying to make his own faces just as funny which works out great with the bed head he always has in the morning. 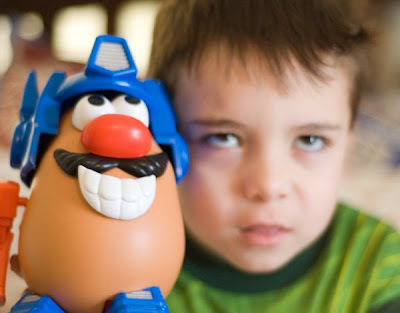 Now he's got his eye on a Spiderman potato head he's seen at Target. He has to say hello every time we go by them. Now that the party is over, we're up for a day of cleaning up, picking up sticks and pinecones, and finding out what comes next in Prince Caspian. 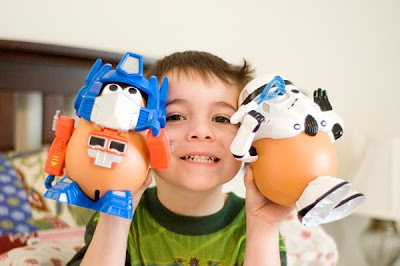 Have I mentioned that Joel has a collection of Mr. 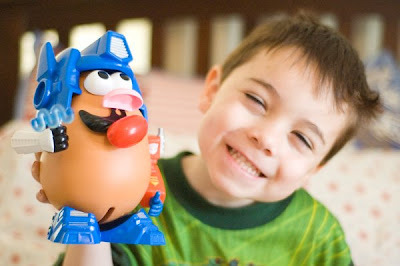 Potato Heads? He used one once for a children's sermon and somehow that turned into his icon. 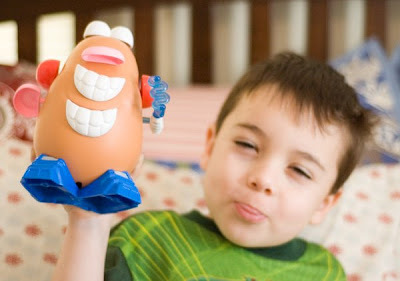 People often buy him the latest Potato Head just for fun. He has a rather large collection in his office. The one he wants now is the newest Spiderman one. 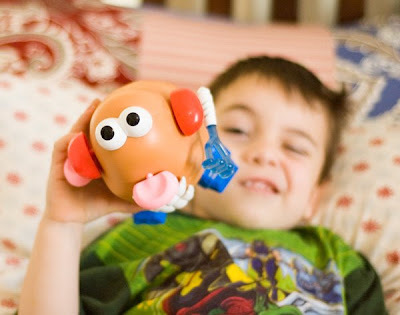 Your little cutie looks like he has lots of fun with them too. It was fun to look at the pics...especially the ones with funny faces!